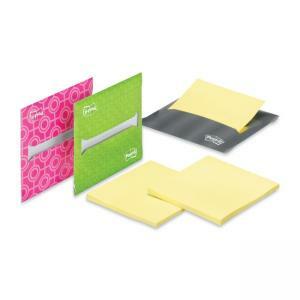 Post-it Super Sticky Laptop Note Dispenser is designed for use with Laptop Computers to keep note within reach no matter where your office is. Slim, durable dispenser sticks firmly, repositions easily and removes cleanly. Dispenser holds 20 Pop-up Notes and is refillable. Super Sticky adhesive adheres to any hard surface and holds stronger and longer than most self-adhesive notes. The accordion-style notes pop up one at a time. Paper used comes from well-managed forests where trees are replanted.